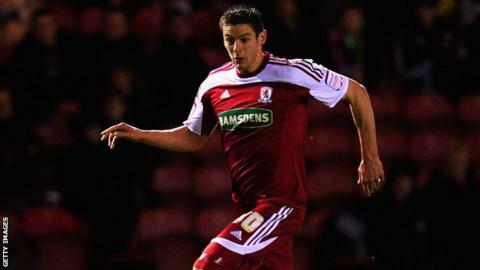 Lukas Jutkiewicz marked his first Middlesbrough start of the season with two goals to end leaders Blackburn's unbeaten Championship start. Jutkiewicz, who missed the first month of the season following a summer knee operation, drove in an early opener. The striker then guided in a header from Mustapha Carayol's left-wing cross to ensure Boro's first away league win. Grant Hanley headed in for Blackburn late on, before Jordan Rhodes had a penalty appeal rejected. But Rovers boss Steve Kean faced more chants demanding his departure at full-time from fans angry at the direction the club have taken under his management. Middlesbrough had failed to pick up any points from their first three Championship away games, while Blackburn went into the game having made their best start to a season since 1994-95, when they won the Premier League. But it was the visitors who took the lead in the seventh minute, as Jutkiewicz flicked a long ball on to Marvin Emnes, then collected the return and outpaced Blackburn defender Gael Givet before beating keeper Paul Robinson at his near post. The home side struggled to respond to the early goal, and were lucky not to concede another when Grant Leadbitter's inswinging free kick drifted just beyond the far post as Robinson floundered. "Middlesbrough totally deserved the three points. You wonder how they haven't got more away points this season. They took total control from the get-go. But when Grant Hanley headed that late goal for Blackburn, it was game on. It's a shame there are so many 'Kean out' chants, because they distract from the fact that Blackburn gave it a really good go." But they almost equalised right at the end of the first half, when Fabio Nunes's left-wing cross eluded keeper Jason Steele and glanced off the crossbar. The start of the second half was delayed briefly when a sprinkler started spraying water at the Darwen End, and the match was then held up twice as two more went off behind the goal. Carayol went close for Middlesbrough in the first minute of the second half when he sprinted in from the left past Bradley Orr and drove in a low cross-shot that Robinson half-stopped and Olsson cleared. But the Gambian winger, a summer signing from Bristol Rovers, set up the second Middlesbrough goal on the hour with a left-wing cross, with Jutkiewicz pulling away from Hanley to guide a header into the top corner. Blackburn did enjoy a spell of pressure after that, with Dickson Etuhu, Rhodes and Scott Dann all denied. Hanley, on as a substitute for shoulder injury victim Olsson, headed in a Nunes cross to set up a frantic finish, which saw Rhodes have a penalty appeal rejected when Justin Hoyte appeared to foul him. "We didn't get going until much later in the game than we anticipated. We just left it too late. If we had scored a bit earlier, we might have got something out of the game. "We felt we should have had a penalty late on. Jordan Rhodes had his standing leg caught. We're disappointed to lose the unbeaten run, but we're still top." "We deserved to win. Not many people could say we didn't. We were disappointed to come in at half-time only 1-0 up. And in the end, we showed the qualities we needed to see it out. "Sometimes Lukas gives us the platform to play off the front. You saw that tonight in the performances of Marvin Emnes, Mustapha Carayol and Josh McEachran."